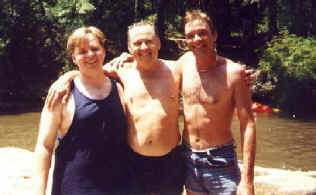 Here is me, my dad, and one of my brothers, Danny last fathers day. We went on a canoe trip. 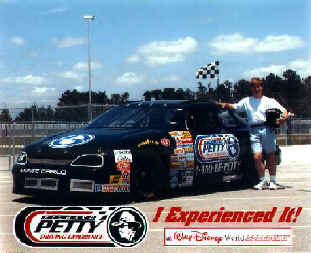 Here I am at Walt Disney Speedway's Richard Petty's Driving Experience. I got to ride 3 laps in Jeff Gordon's Car. Im not one for Chevy's, but that one scared the crap out of me! This last picture is a picture of my 14 year old cousin Chris. It was taken at the last Fun Ford weekend in Baton Rouge. He is a chevy man that I have been trying to convert to Ford. 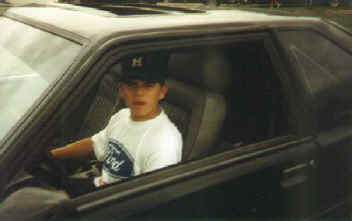 You see we got this shot with him at a Fun Ford event, with a Ford Racing shirt on, and in my Mustang-hehe! Gotta Love it!